Delicious and Effective – 10mg of CBD per piece, 40mgs per pack! Formulated by our Chief Science Officer, a board-certified toxicologist, and pharmacologist! Includes our organic, full-spectrum, CO2 extracted, third-party tested, hemp-derived CBD, perfectly blended with our proprietary terpene formulas for the specified effects – Focus, Power, and Recovery! A perfect balance of tropical fruits for a mouth-watering flavor, and energizing effect. Promotes alertness, increases energy levels, enhances cognition, and mood, stimulates mental and physical activity, aids in relieving anxiety and inflammation. 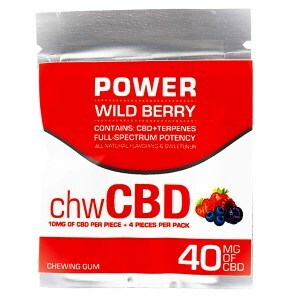 Ingredients: Gum base, sorbitol, isomalt, full-spectrum cannabidiol (CBD), niacin, vitamin-B6, vitamin-B12, green tea extract (caffeine), stevia, all natural wild berry flavoring. Tangy and tart, a great option for acute aches and pains. Assists with pain relief stimulate circulation, eases the sense of nausea, and enhances mood. Aids in relieving anxiety and inflammation. 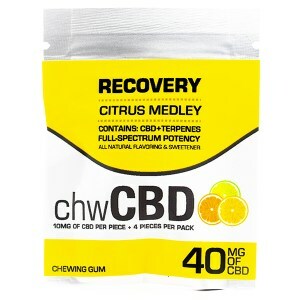 Ingredients: Gum base, sorbitol, isomalt, full-spectrum cannabidiol (CBD), vitamin C, vitamin B12, green tea extract, stevia, all natural citrus flavoring. Cool and invigorating, a refreshing flavor that keeps you attentive. 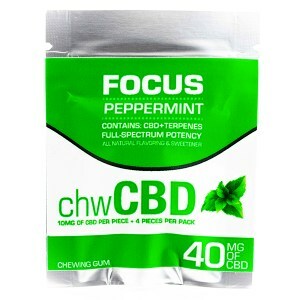 Promotes mental focus, memory retention, alertness, and enhances mood. Aids in relieving anxiety and inflammation. Ingredients: Gum base, sorbitol, isomalt, full-spectrum cannabidiol (CBD), L-Arginine, Taurine, caffeine, stevia, all natural mint flavoring.